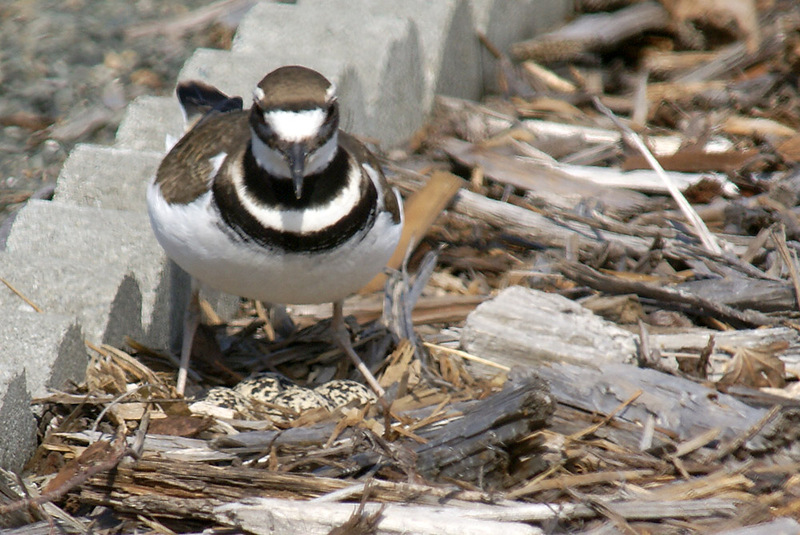 Killdeer are common here near Dungeness Bay. We hear them flying over day and night on whatever business they have. They also walk in the middle of the road and act like they own it, even today with six inches of snow on the ground. I've had many opportunities to photograph them in the neighborhood where they are particularly conspicuous during nesting season when they challenge anybody that comes near, pretending to be injured and trying to lure you away from their nest. One of my favorite photo ops was at a neighbor's back yard about a block away. 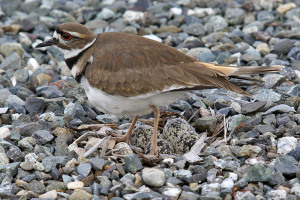 On April 3, 2009, mama Killdeer laid her fourth egg in the bark path between the back door and the small shed used daily as an art studio. My neighbor had to leave the path and take a longer route to the studio to avoid disturbing the birds. I was invited over to use the studio for a blind to take pictures. Even knowing where the nest was I couldn't spot the eggs unless the adult was near. Incubation takes 24-28 days. Although the female lays only one egg per day, all eggs hatch within about twelve hours. So we were able to anticipate when the eggs would hatch and be ready to take pictures. I started visiting the nest area daily on April 25th to check progress. I was able to approach from behind the studio and only had to peek around the corner to see the nest and check on the eggs from a distance. Late afternoon on April 27th there were still four eggs. I got an excited phone call on April 28th letting me know the first chick had hatched. I spent several hours that day and the next photographing the happy family from my hiding place in the art studio. At the time, I had not yet started shooting videos of birds. Rather than stack up 22 images below, I decided to show them in a video slide show with audio recordings I made of the pair talking back and forth in the yard. These are mostly their "Deet-deet-deet" communications. The next to last image, though, shows an adult in its classical distress display, and you will hear its alarm call then. As the slide show progresses you see the four eggs, then the first chick, then two chicks, then three, and finally all four chicks. Shortly after a chick hatches, one of the adults picks up the shell and flys away to dispose of it so it won't attract predators. Click Here to play the video in your web browser (requires an HTML5-compliant web browser). There are various controls to start and pause the video, adjust volume, view in full screen mode (try it). When you finish, click the HOME button at the bottom left edge of the page, or click the picture of me in the upper left corner of the page, to return to this page. If the video won't play in your web browser click here to try it with your system software. Now fast forward to June 2013. I had left the nesting Killdeer alone for three years, but I had just started taking video a couple months earlier and was looking for opportunities to do more. 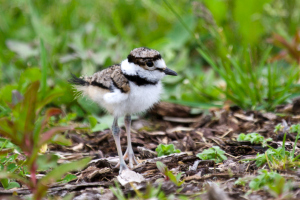 As in 2009, my neighbor had let me know when the female Killdeer laid her fourth egg and we calculated that the eggs would start hatching around June 26th. I checked on the 25th and there were still four eggs, as you can see here. This year the nest was several feet away from the path, and my neighbor put a sawhorse near it to keep from walking through that area and stepping on the eggs. You can see one leg of the sawhorse in the video. From my hiding place in the studio I couldn't line up on the nest without getting that leg in view. I set up the video camera on a tripod just inside the studio door and left the door cracked open just enough to shoot through. The adult Killdeer saw me go in, of course, but couldn't see me when I was hiding inside. They were aware of me but didn't seem too upset. The video was taken mostly on the mornings of June 27th and June 28th. It was foggy on the first morning, but bright and sunny the second morning. You'll notice the difference in lighting about halfway through the video. If you play the video in full screen mode, and watch very closely at 1:11 into the video, you can see the top of the left egg move as the chick tries to break out. You can stop and rewind to play that bit several times until you see it. Click Here to play the video in your web browser (requires an HTML5-compliant web browser). When you finish, click the HOME button at the bottom left edge of the page, or click the picture of me in the upper left corner of the page, to return to this page. If the video won't play click here to try it with your system software. Late one evening, shortly after moving here near the edge of Dungeness Bay in November 2007, I was surprised to hear several Killdeer flying over calling loudly. Click the Play button on the audio control to listen to a recording of a couple Killdeer as they make two passes over my back yard last March. Notice the doppler effect, where the sound gets louder as the birds approach, and fainter as they move away. Turn up the volume and you can hear them in the background between the two passes. 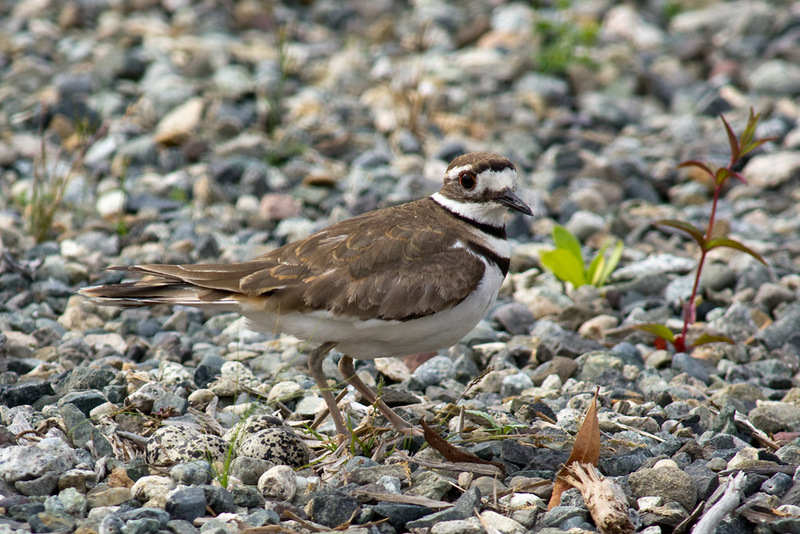 Killdeer were not common around our home in north Seattle, but I learned they are common here in Dungeness all year. 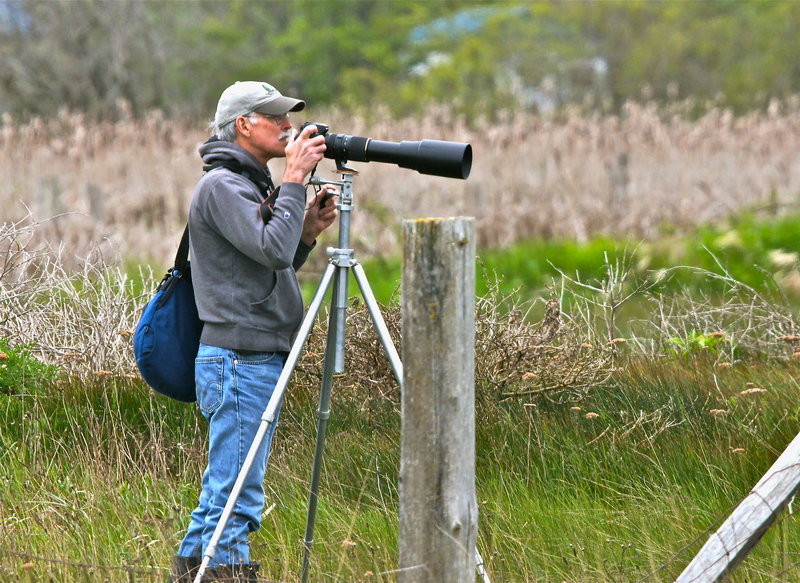 A few weeks later 127 were recorded for the 2008 Sequim-Dungeness Christmas Bird Count. 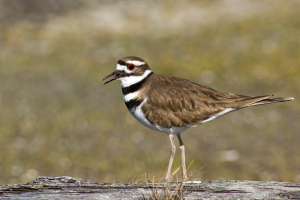 We started seeing and hearing Killdeer regularly in our neighborhood and various birding locations around Dungeness. In March 2008 a neighbor across the street invited me to photograph a nest in a gravel area next to their driveway. Even with good directions i couldn't locate the nest until one of the adults returned to it. During the summer, Killdeer would frequently dash in front of me and try to lead me away while I mowed the lawn near the drainage ditch next to the road. They had a nest in a gravel area across the road and when I got close to the street they would put on their broken wing performance in my yard. I couldn't hear them while the lawnmower was running, of course, but click the audio link to hear their alarm sputter. Killdeer chicks hatch fully feathered with eyes open and ready to start exploring within a few hours of hatching. Killdeer are very vocal throughout the spring and summer. They are often calling in the background while I'm trying to record some other bird that is singing. In 1909, William Dawson published his two-volume Birds of Washington. 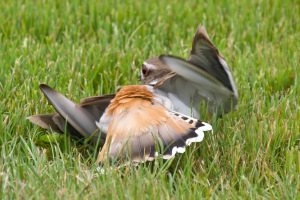 His delightful story about interactions with Killdeer in the field is a good read. This link is easier to read if you use the controls to view it in full screen mode, enlarge the text, and flip pages.